A FOURTEEN-YEAR-OLD girl, Shalom Alejandra Treviño, has been missing from her Costa Blanca home since last Wednesday. The girl, from Altea, was last seen wearing dark shorts, a black and white striped sleeveless top. She has braces on her teeth and is 1.55m (5ft 1in) tall. Her desperately worried mother, Marina, has asked the public to ring 34 642 650 775 / 34 649 952 957 or email [email protected] if they see her daughter or can give any clue regarding her whereabouts. Marina also broadcast a message to her daughter in case she hears it herself or someone else can pass it on to her. “If you’re listening, please come home. We need you, you know we love you very much and you’re so necessary to us,” Marina said. 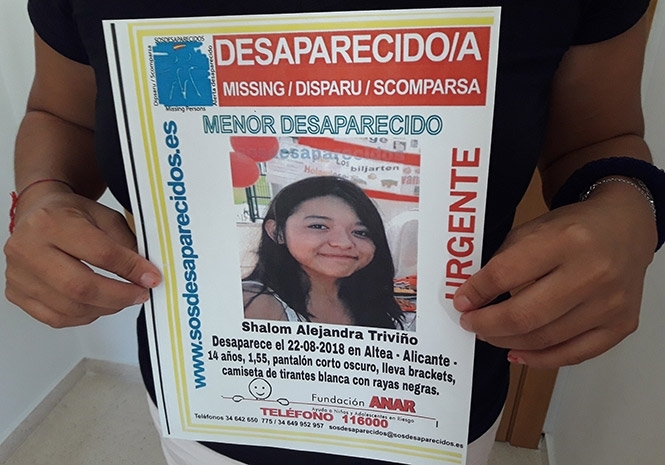 This is a most urgent case, the Guardia Civil said on Twitter, asking anyone who can shed light on Shalom Alejandra’s disappearance to call the 062, 091 or 112 emergency numbers or the Policia Local in Altea on 965 845 511.